The commercial which flashed across the screen promised a great time on the Celebrity Constellation with a lineup of musical acts from the "Flower Power" era, with stops in Key West and Cozumel. 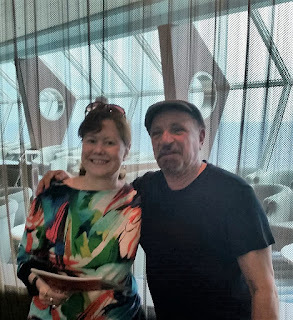 I reminded my husband that my birthday would be occurring around the time of the voyage, so he purchased tickets almost a year in advance, which was a good thing because the five-day cruise sold out quickly. 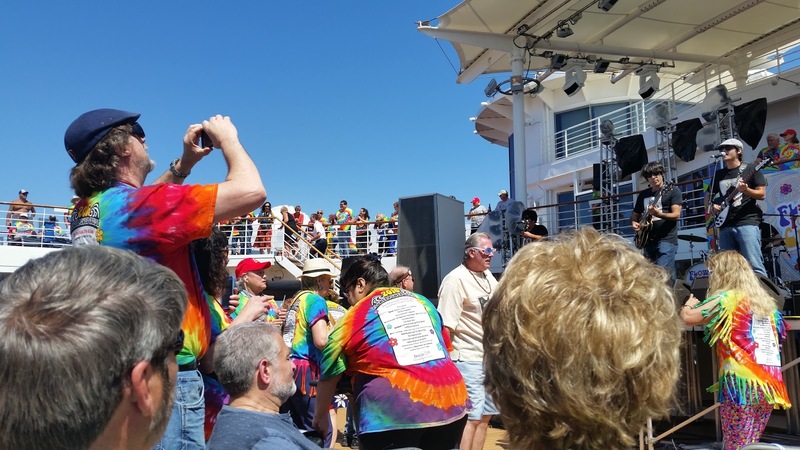 We set sail on February 29 with about 2,000 fun loving music fans and a jam-packed schedule of events, which sometimes overlapped, forcing us to miss a few we may have otherwise enjoyed. Headliners included Peter Noone from Herman's Hermits, Peter Asher, Blood, Sweat & Tears, featuring Bo Bice, Felix Cavaliere from the Rascals, Micky Dolenz of the Monkees, The Grass Roots, the Guess Who, Jefferson Starship, Mark Lindsay of Paul Revere and the Raiders, Gary Puckett and The Union Gap, the Buckinghams and The Family Stone. 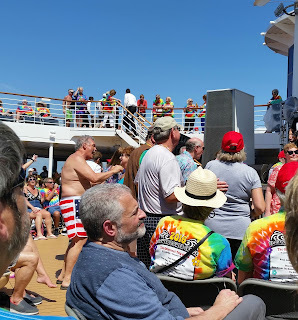 The weather was glorious the entire time and the pool area was packed with revelers during the "Sail Away Party," many of whom may have done a better job smuggling booze than I did because some seemed pretty looped. Spotting a t-shirt that read, "Growing old disgracefully," gave me a laugh. 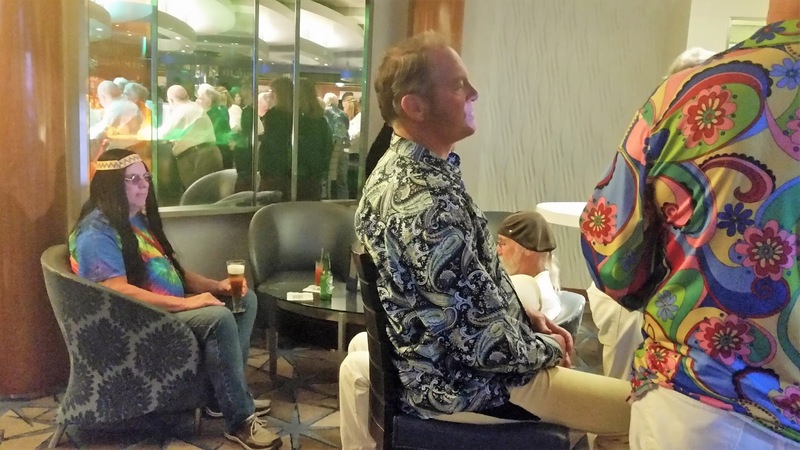 After the kickoff party and dinner, we arrived on time for a Peter Noone concert and were forced to sit in what may have been the worst seat in the house, so we quickly learned to show up a half hour early for events. The British singer was big on audience participation and people were up on their feet joining him in rousing renditions of songs like "Henry the 8th." Noone looks great for his age and at one point a lady in the audience shouted out that she wanted to see him in the hot tub later. He garnered a lot of laughs with his reply: "In my country, they call that 'fat boy soup.'" Noone is a good sport. A few years ago I was assigned to interview him over the phone for an upcoming appearance at the Luhr's Center in Shippensburg, Pennsylvania. Unfortunately, a faulty cell phone connection made things difficult and the line went dead several times, causing me to almost blow a gasket and utter words I don't care to repeat here. Thankfully, he continued to patiently answer the phone each time I called him back. Each morning on the long walk to breakfast, (our room seemed to be in the hinterlands), '60s-era music softly resonated down the long halls. 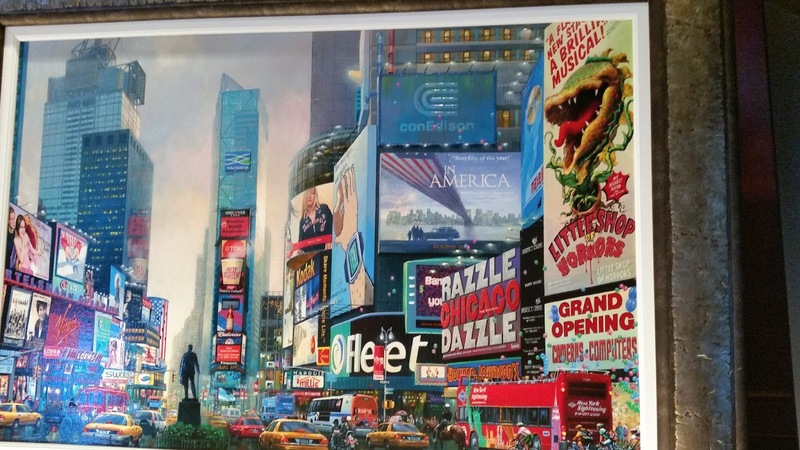 I find it humorous when I recall the names of bands like the "The Electric Prunes," ("I had too much to dream last night,") and "Strawberry Alarm Clock," which provided us with soothing muzak as we marched towards the coffee bar. 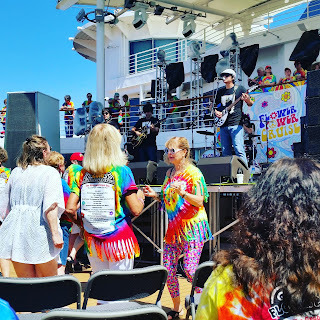 On day one we joined about 300 other cruisers at 9:30 a.m. for a trivia competition where they played YouTube clips of songs from the Flower Power era. I found myself joining in the group singalong to the songs I knew, like Procol Haram, Iron Butterfly and Quicksilver Messenger Service. Although we failed miserably identifying the bands in many of the mostly black-and-white clips, it was a lot of fun. Mike teased me when I informed him that I used to sob when I heard Bobby Goldsboro sing this song so many years later on the radio. Now I find this YouTube clip and there's a cute little white dog in it, which makes matters much worse! 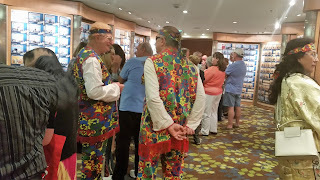 Some people on the ship went all out with the hippy garb, making me wonder where they found it all. 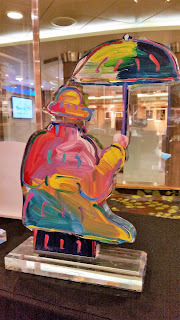 I would have liked to have snapped more pictures, but didn't want to be a bother, so I managed to capture a few shots by sneaking around surreptitiously. This happenin' dude wore Lucite platform shoes with fake goldfish embedded in the heel. While out at sea, performers kept the party going and the "love generation" let down what hair they had left and there were more than a few poolside parties. Here Beatles tribute band belts out tunes like "I Feel Fine" and "Can't Buy Me Love," and on the last day we enjoyed a poolside rendition of "Hot Fun in the Summertime" by the Family Stone. The guy in the background seems to be having the most fun in this picture. Some of the indoor activities included educational lectures, all of which were not as worthless as the booze lecture. 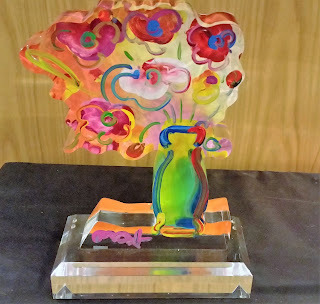 I sat in on several, including one titled, "Three Days of Peace and Music," presented by Wade Lawrence, senior curator of the museum at Bethel Woods. Lawrence's presentation included clips from each day of the iconic event, which was held in the summer of '69, featured 32 bands and cost $8 (for those who paid.) I found it interesting that Hendrix played last when the crowd had dwindled from 400,000 to a mere 50,000. 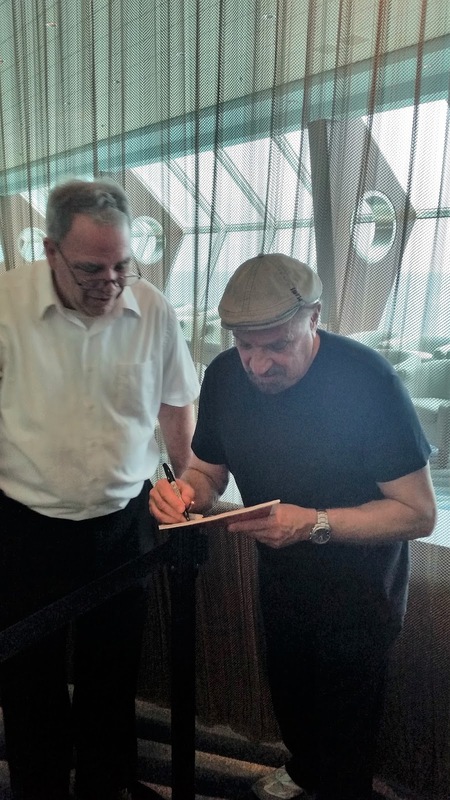 The room was packed for the "Q&A" featuring Felix Cavaliere, The Grass Roots and members of the "Guess Who," from Canada, whose concert was great, by the way. Sadly, only two original members of the the group remain with us today--drummer Gary Peterson and bass player Jim Kale. Kale revealed a shocking factoid that "American Woman" was written about the Statue of Liberty. Because I was stuck behind a pillar (once again due to not showing up quite early enough) I couldn't see him, nor gauge the audience response all that well. After sharing that with the audience, he quickly added, "We were young, dumb and we shot off our mouths." Kale then went on to tell a less controversial story about "Clap for the Wolfman." The novelty song, was initially deemed,"Clap for Napolean," but one day they happened to be listening to Wolfman Jack on the radio and decided to include him in a recording session. According to Kale, "The Wolfman" brought along his standard cigarette pack full of joints and it morphed into one big party, with the Wolfman's part unscripted. It was then that I realized he really was "rating records high." I had to pass on a few other lectures due to schedule conflicts. 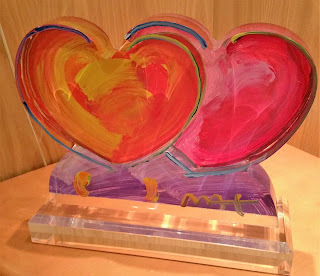 One, in particular, was a seminar on renowned artist Peter Max. 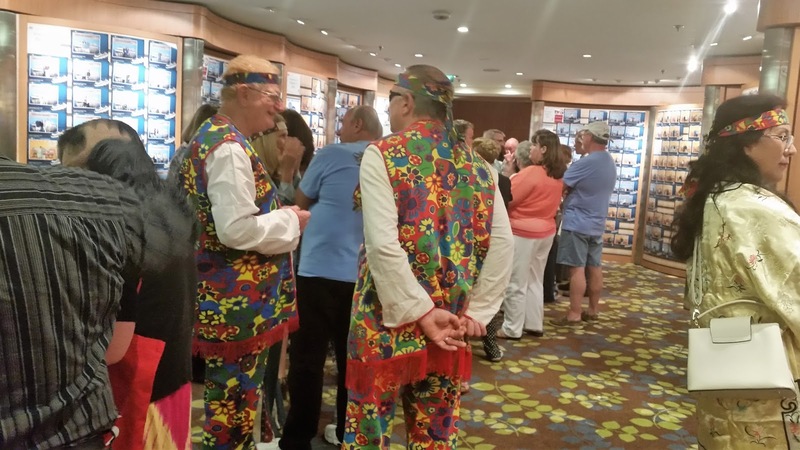 Most cruises hold art auctions and Celebrity is no exception. Guests are invited to sip champagne and bid on various pieces. Because of Peter Max's popularity in the flower power era, many of his works were shown in the gallery like these pricey sculptures, with pricetag reaching $30,000. Other pieces presented at the auction included this one. 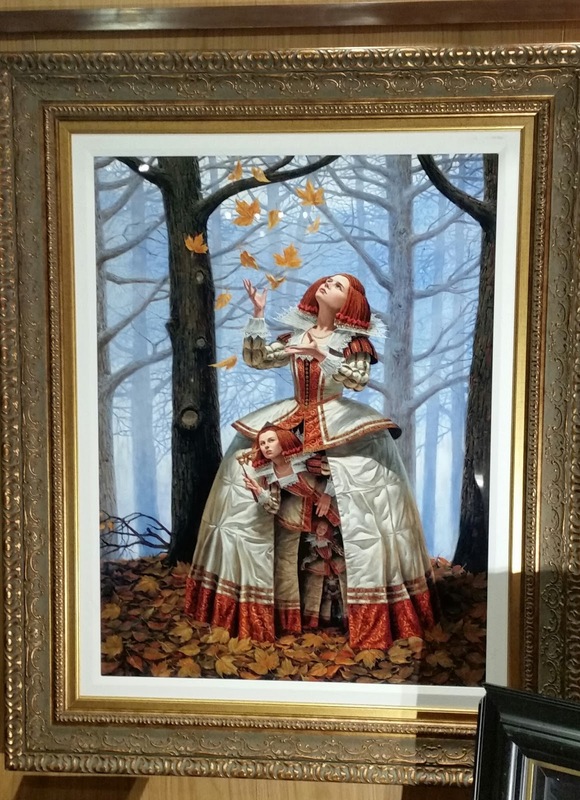 Created by Michael Cheval; it was stunning up close. The camera does it little justice and the copper colors "pop." 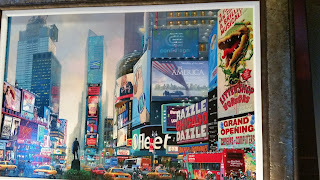 My husband and I ended up with this work painted by Alexander Chen since we enjoy cityscapes and advertising. 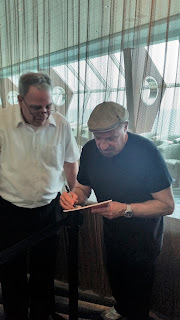 The cruise featured a few "meet and greets," and I hear Gary Puckett was very gracious as was Felix Felix Cavaliere of the Rascals, who put on a great concert and autographed a publication for which I write. Other concerts we attended included Jefferson Starship, Blood Sweat & Tears with Bo Bice and The Grass Roots. I learned while in line to meet Felix Cavaliere that Bo Bice somehow managed to offend a few people by complaining about the Beatles in relation to Blood, Sweat and Tears not making the cut for the Rock & Roll Hall of Fame. Evidently a few walked out during the first show. The Guess Who concert, started out on a high note with a few of their popular numbers like "No Sugar Tonight" and "American Woman," which really pumped up the crowd. 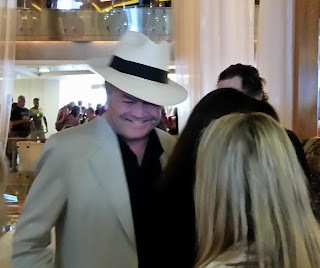 Sometimes musicians would chat with us in elevators, or we'd be relaxing in the pool with them only to see them on the stage later, which was a bit of a shock. Micky Dolenz from the Monkees was spotted throughout the ship and we sat in on a "Q&A" with him as well. Learning so much more about the music of the '60s and experiencing meeting members of various groups who helped shape an entire generation was interesting, to say the least. Even though some have only a few original members left, those "originals" filled in so many backstories in the "Q & A" sessions. 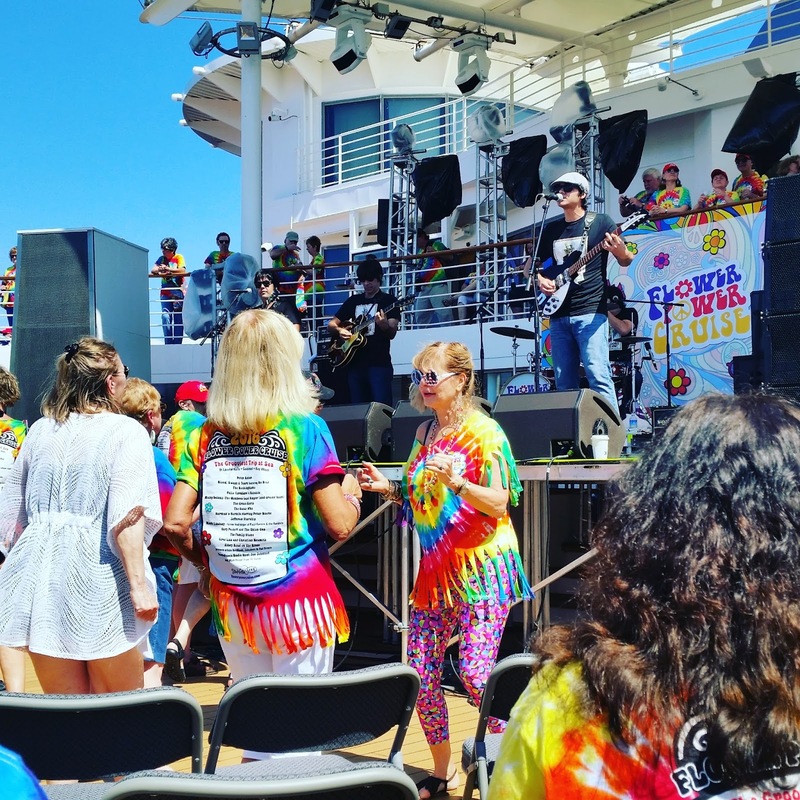 An even bigger lineup is scheduled for next year's Flower Power Cruise, including Eric Burdon and the Animals, The Fifth Dimension, The Lovin' Spoonful, Rare Earth, and Three Dog Night, to name a few. Three Dog Night performed in our area not long ago and I had the opportunity to interview lead singer Danny Hutton, which you can read here. Setting sail on the inaugural cruise was thrilling, but I'm thinking that next year will be better as they work out the scheduling conflicts and other issues that may have cropped up. If you're considering booking a trip for next year, you can learn more here, just keep in mind, tickets sell out fast. Up next--our visit to Key West and The Hemingway House. I know, right? It was either one or the other, financially speaking...and I'm almost out of wall space with art, so I had to let it go.